People often ask me when I think the housing market recovery will begin or end, and my answer has always been more focused on the process, rather than the event. A full recovery in the real estate market relies on population growth and time in order to restore the balance of supply and demand that has gone awry, and my last analytical post about time frames for the recovery anticipates housing market equilibrium in 2018. The good news is that the recovery has been underway for years. The bad news is that a housing market recovery is much like a personal medical recovery ... it is filled with pain and it takes some time. In order to provide a very simple demonstration of where I think we are now in the healing process, I want you to consider a world without real estate market cycles. What if time of year and outside influences had no impact on the number of homes that would sell each day/week/month/year, etc. If this were the case, supply and demand would always be in balance and real estate reporting would not be needed. Now, what if we compare the real world to this world with no market cycles? 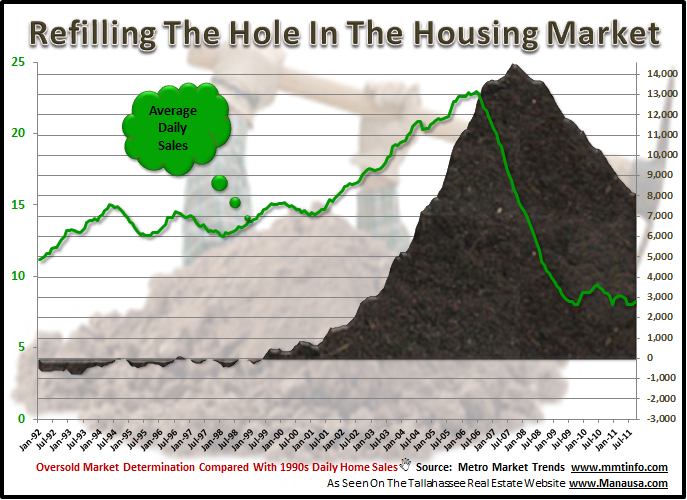 Wouldn't it provide a glimpse of where we are in the housing market recovery? By determining a cycle-less market and using it for comparison, we can develop a gauge of the current status of our real estate market recovery. Think of the current status of the Tallahassee housing market with a vision of you standing in your backyard with a shovel. Every time you take a scoop of dirt out of the yard, you throw it on a growing pile. The deeper you dig, the higher the pile becomes. To find balance in the real estate market, we have to get back to level, just as you would have to refill the hole in your yard with the dirt that you dug out. I created the real estate graph below by establishing a cycle-less average number of home sales, based upon the number of homes sold in Tallahassee in the 1990s. I then compared the total number of sales each month with this average to determine just how large our dirt pile remains. It is much larger than many people will expect. Based upon our "hole in the backyard" view of the housing market recovery, we are still over-sold by 7,942 homes through the end of September. Our current rate of shoveling has us refilling the hole with a scoop of 161 homes each month, which would level the yard (balance the market) in 49 months, which is October 2015. This simplistic view of the real estate market has many flaws, so I would not recommend that you consider the conclusion as accurate, but I would suggest that is clearly shows why our market is poised to under-sell for many years to come. There is a correlation between the number of homes that sell each year and the number of people (population size) who live in an area. We sold at a rate far higher than normal for 7 years, and we cannot expect a housing market recovery without giving much of that back.